September 21st in Religious Themes by Wordpress Jedi . ChurcHope: a super attractive and responsive theme for churches. It has plenty of custom widgets and is highly customizable. 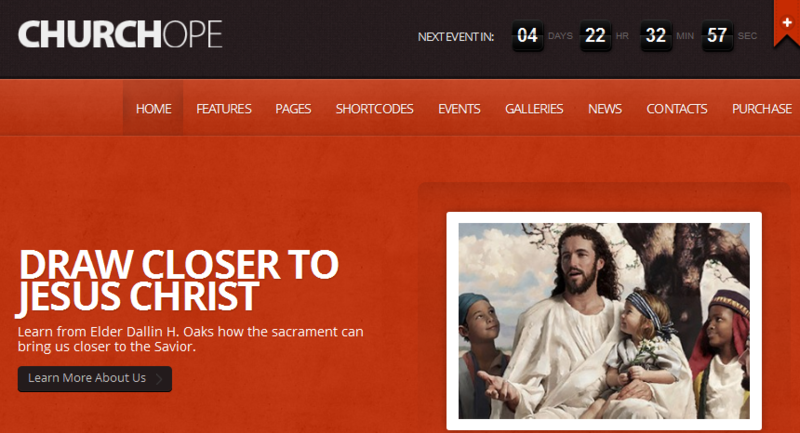 March 16th in Premium Themes, Religious Themes by Wordpress Jedi . Every corporation and organization that wants to reach out to more people and realize its potential is going online these days. In fact, if you are part of an organization that does not have an online presence these days, you are missing the boat. The same concept applies to religious organizations as well. Whether you want to build a presence for your church or want to get people familiar with other religions, building a website is a good way to go. Grace theme for WordPress could come in handy here. It’s an attractive theme designed for those who want to build an online presence for a religious organization such as a church. It’s affordable, customizable, and quite professional-looking. Grace is designed mainly for churches, but you can modify it easily to make it work for whatever religion you want to promote through your website. It comes with three color themes to give you options. The theme is also video and image friendly, so you can add pictures and videos of your events to your website fast. 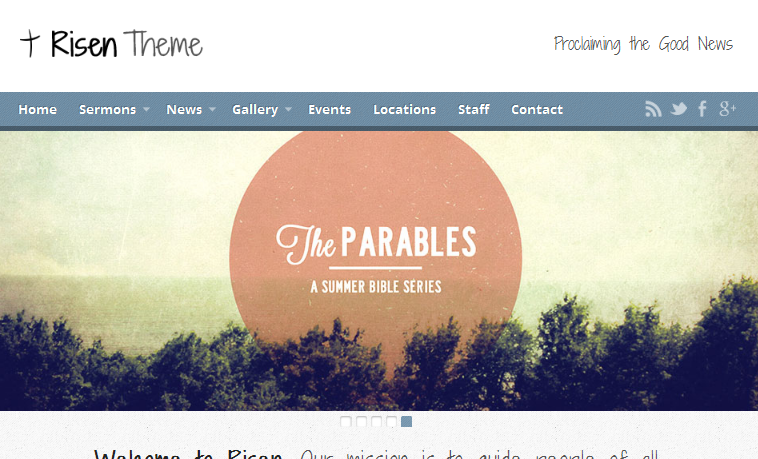 June 18th in Premium Themes, Religious Themes by Wordpress Jedi . Every organization, whether for profit, non-profit, or religious organization needs an online presence these days. People are spending a whole lot of time online, and if they have heard about you, you can be sure that they are going to come look for your website. No longer can you tell people that you don’t have a website. Not in 2009. Many churches have realized that they need to be online to reach out to others in the community and get more people involved with church activities. While the temptation is always there to spend a lot of money on a custom design, you can always go with a premium church theme to get the job done. Church Theme by StudioPress is a premium theme designed specifically for anyone who’s looking to start a church website. Whether you work for a church or have been hired by a church to upgrade its online presence, Church Theme has everything you need to set up an attractive christian website. 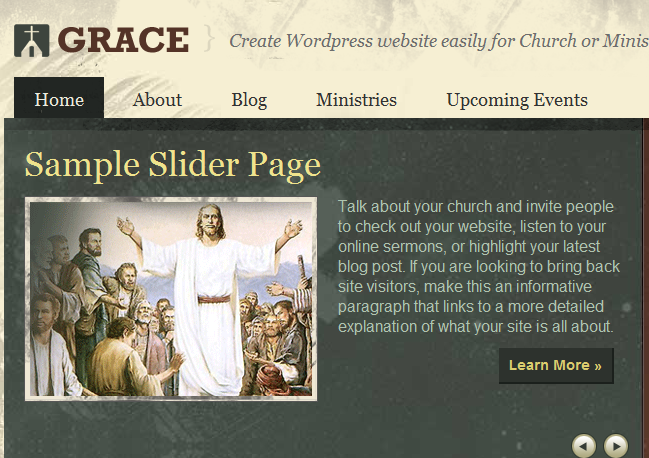 Church Theme makes it easy to add images and feature them on your home page. It also comes integrated with YouTube, allowing you to push your church videos right on your side. You also get drop down menus allowing you to add as many categories as you wish to your website. You can also change your ads around easily or just use the ad spots to promote religious events in your local community. What I like about Church Theme is the fact that you can easily feature your top categories on your home page. Adding new featured images is like a piece of cake. Best of all, the theme is optimized for search engines. That means you are going to get a lot of free traffic to your website if you play your cards right and use the right keywords. It does help that you don’t have to spend a fortune to get your hands on this theme. All in all, if you are looking to create a church website and customize it fast, you should consider testing Church Theme.